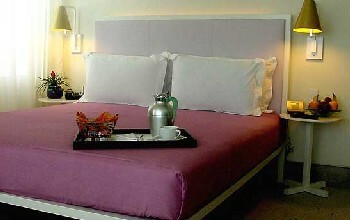 Miami Beach 411 > Hotels > 5-star > Shore Club Hotel in Miami Beach, FL. ¿Hablas Español? ABOVE: A video tour inside a standard room at the Shore Club. Watch more hotel videos. This page allows you to watch a video find directions, post a comment, read reviews, and check rates at the Shore Club Hotel. Help support Miami Beach 411 by making your hotel reservation with us. Rather make your reservation over the phone? Call toll free in the US or Canada: 1-800-573-6351. The Telephone Hotline is open 24/7. And don't forget, you also get rebates on multiple day stays. We hope you enjoy your visit. Don't hesitate to contact us should you encounter any problems while you are here. Rates: Low season from $345. High season from $475. We guarantee the rates you find at Miami Beach 411, will match the exact same rates as our booking partners, Expedia and Hotels.com. Because of the large number of reservations we process, our booking partners are able to negotiate special web rates with many properties. We guarantee these rates are the lowest you can find. If there is a lower rate for the same dates at the same hotel, we will either refund you the difference or cancel the reservation without penalty. The Shore Club's 3-acre, Moroccon-themed grounds are carefully designed to create a tranquil, otherworldly retreat. The resort is designed for lounging in style. The Hotel is located on a wide stretch of Miami Beach, with lush, landscaped gardens, two ornamental pools, fitness cencet and a lavish patio. Behind the Hotel, an ocean boardwalk with benches is a great spot for strolling day and night. Nobu restaurant calls the Shore Club home, and Skybar's deep red poolside club is one of South Beach's most in-demand nightspots. Valet parking is available, but you can save a few dollars and park at the nearby 13th Street and Collins Ave. garage for a rate of $8 per day. High-speed wired Internet access (Cable connections) is available in the guest rooms for a charge of $5 per hour or $15 per day. • The Shore Club accepts pets for an additional charge of $100 per stay. Click HERE for Shore Club Lodging Information. • Leaving the Airport, follow signs to 836 East (Beaches). • Take 836 East to 395 East (Miami Beach) to A1A East. • At the end of the Causewy, A1A becomes 5th Street. • Continue East on 5th Street 7 blocks to Collins Ave..
• Turn Left (North) on Collins Ave..
• The Shore Club is on the Right (East) side of the street. The Shore Club is located at 1901 Collins Ave., Miami Beach, FL 33139. Use our Miami hotel map to find the exact location. Shore Club "Overpriced, Pretentious "
I am in the film business and have traveled the world for twenty years in film production. I found myself in South Beach shooting a film recently and was given accomadations at the Shore Club. I can honestly say I know a good hotel when I see one, wether it is the Peninsula in Hong Kong or the Ritz in Paris. The Shore Club will never be on my short list! As I arrived in my Limo a drunk club patron fell on me as I tried to get out of the car. The pounding music filled the lobby and all I wanted to do was sleep as it was late. As the porter led me to my suite I noticed how stark and dank the hotel was. It reminded me of a mental institution from some bad B movie. The suite was worse. STARK, CHEAP INDONESIAN ikea style furniture. Horrible grey tiles throughout that are noisy and feel like sandpaper on your feet. I guess this is the managements idea of luxury on a budget. Believe me, they saved a bundle. And the room service, the highest I have seen in my life. For two weeks I had to use Earplugs to SLEEP!!! The front desk sent them up immediately. I guess they are used to being asked for them! OVERPRICED, DANK, INSTITUTIONAL, you would have to be nuts to stay here. Those who are really hip should look elsewhere! From the Stars in our cast to the Costume Designer, no one from our group will ever come back!!!!! AVOID!!!!! Shore Club "Will never return"
We booked our stay at the Shore Club on line prior to reading the reviews in 411. Unfortunately, we arrived early (10AM) checkin was at 3 PM. We were given the standard reply "Here's my card with phone number - The front desk will call you when your room is ready". Don't hold your breath. We finally were taken up to our room @ 5PM. We were so upset by the room that we refused it and wanted to leave immediately. Room was so tiny you could hardly walk around the bed. Small window viewed the hotels garbage bins. Front desk offered us a bigger room that had a huge patio unfortunately, it was on the second floor over the bar club. Music played until 2 am. The Shore Club needs lots of help from a good manager! It is definitely not worth a 5 star rating. Shore Club "Awesome or was it?" Shore Club "Ambivelent about Shore Club"
I am still iffy about the Shore Club. I too had to wait 3 hours to check it, did not get the rooms promised and had to beg for towels daily. I also thought the "bottle" requirement at the hotel was insane, you basically could not sit anywhere unless you spent $300+ on a bottle of vodka ! I thought the staff was somewhat arrogant, but still, loved the access to Sky Bar , star spottings, and accessibility to every good restaurant and club around. If you like to drink smuggle in a few bottles of booze, 5 day bar tab over $2000! We stayed for fouir days the accomidations were great. One night we we sitting in a hammock enjoying our drinks. We had several rounds as we didn't have to Dr.. A cocktail waitress from the sky club walks over with 7 people standing over us and said "your going to need to get up these people want to sit in the hammock and they are buying a bottle of champagne." I spent thousands of dollars over the weekend and this little twit is going to tell me to get up. I'm in the hospitality business and I never treat guests this way. I won't be returning. Oh yes I complained to the manager. He said they weren't really part of the hotel. WHATEVER! Shore Club "Needs Customer Service Training"
Arrived at the hotel at 2:45 and was immediately informed check-in was at 3 p.m. Okay, no problem. But two hours later we are still awaiting for the room and not once did we receive an apology for the delay. In fact, the attitude of the counter help is what you would expect from a one star motel not a five star chic Hotel. Overall, great amenities, nice room and pool area. However, take your money next door to the Sagamore or the Raleigh I am sure they will be happy to treat you better. Shore Club Hotel in Miami Beach. Miami hotel reservations.